"Christmas, before the trees and presents and reindeer took over, harkens to the birth of Jesus, God’s Son, in the Christian tradition. It’s nearly certain that the date isn’t right for Jesus’s actual birthday, but that’s never been the point anyway. Christmas is a reminder that we are loved. That the Divine hasn’t abandoned us to our own devices, rather he’s joined in the mess. The biblical account gives us a picture of God’s loving intent when it tells us that the Divine himself was born in a manger, where the donkeys and sheep hung out. Whether you practice Christianity or not, the songs and lights and gift giving of the season all point to the reality of love. God’s love for us. Our love for each other. A reality that takes on a new poignancy when you are far from home. So don’t let holiday blues hijack the reign of love. Surround yourself with people to love, whether it’s your travel buddy or a significant other or work mates or new friends you made at the skateboard park." I frequently see articles about teaching and living abroad posted by the recruiter I used to come to Korea. However, I seldom end up actually reading these articles that are probably filled with plenty of words of wisdom. I don't know why, but for some reason I decided to click on this one and give it a skim. To be honest, I wasn't even reading the article very closely when this part caught my eye. I think just about everyone, at least from America, has a special place in their heart for the holidays. While it can be a stressful time of year, who doesn't love seeing the lights everywhere, eating good food, and spending time with friends and family? In many ways, it's hard to avoid being homesick when your'e not home for Christmas. However, this article articulated my feelings quite perfectly. Christmas is truly a celebration of love, and I didn't want to let the fact that I'm away from home "hijack the reign of love." I went into the holidays expecting it to be tough, but determined not to let it ruin the beauty of the spirit at the heart of the season. And overall, I would say that it was indeed a beautiful holiday, filled with love. Having to go to school on Christmas Eve was somewhat brutal for all of us. It wasn't even a slow day for me--my day was busy with 5 classes. Eventually classes finished and before heading out I handed out some presents. I think my vice-principal was thoroughly confused as to why I was giving him a present, but my co-teacher was really surprised and touched. It was really great to see her so thankful because I certainly wasn't expecting such a reaction. 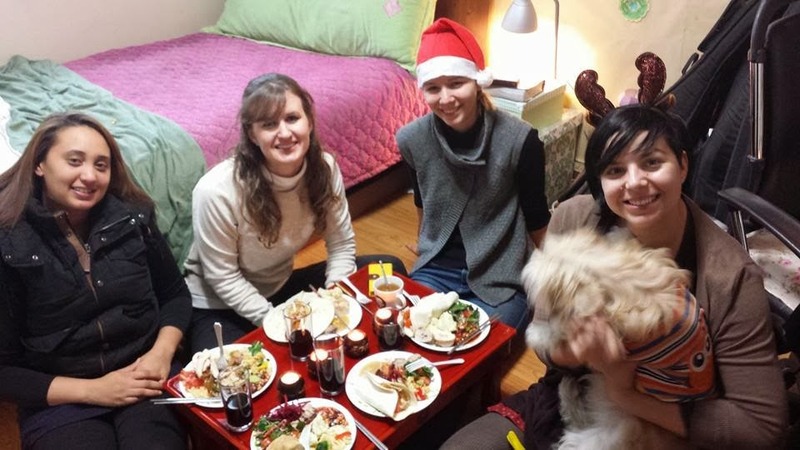 Christmas isn't really a huge deal in Korea. Essentially it's a romantic day more similar to Valentine's Day than to how we celebrate it in America. In fact, all week I told my students that in America Christmas is a family holiday, not a couple's holiday and they were SHOCKED. 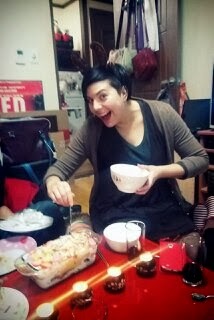 Anyway, gift giving ins't as common during Christmas in Korea, which also probably explains why she was so surprised. After I got out of school, I had to run back to Homeplus because the night before I didn't buy enough wrapping paper. It's times like these that I really miss having my car--instead of quick trip to the store, it requires at least 10 minutes of walking (each way). After my wrapping paper mission was accomplished (I luckily bought paper that was easier to wrap this time), I finished my wrapping for our Christmas Eve gathering that night. We had a lovely evening gathering at Advice, our neighborhood bar with a tavern-like feel. We had a Secret Santa and then a white elephant gift exchange. Overall, it was just a nice night with really great people who truly have become my family away from home. Representing Korea, America, South Africa, and Canada....awesome! The strangest part of Christmas for me was after this gathering was over and I came back to my apartment...and was ALONE I've never spent Christmas Eve anywhere else than in my parents' house, so coming home and being alone on Christmas Eve was a little sad--even though the rest of the night was wonderful. If I'm in Korea next year, I'm definitely arranging a Christmas Eve sleepover. I woke up the next morning, made breakfast, then went to church. My other church-going friends went the night before, so I was on my own in the morning. Being in church as an interesting experience. There I was, the only non-Korean in the church, I was about a foot taller than all the old Korean ladies, and I didn't understand the majority of what was being said. Yet, there were some constants, such as the Christmas carols that were being sung (in Korean, but I knew what they were about). But most importantly, everyone in that church was there for the same reason, to celebrate the presence of God. It is really amazing to be on the other side of the world, where you don't understand the language, immersed in a different culture, yet still share the most fundamental and important beliefs with those around you. Being "brother and sisters in Christ" has really taken on a new meaning to me as I share a unique relationship with those with whom I can't even have a conversation with. 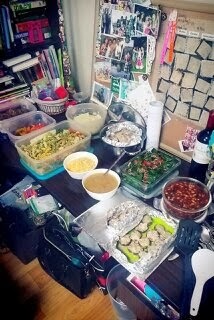 We then packed up all of our stuff and headed over to my friend's place where we had a wonderful pot-luck type dinner. The food was awesome, and after we ate we were all ready to rest so we put on a movie and napped/rested for a bit before going for round two with the food. We hung out for a bit more before we all had to head home for Skype dates. I luckily caught my parents as they were waking up, just in time to catch up a little and wish them a Merry Christmas before I headed to bed. Overall, Christmas was a really comfortable and warm day filled with good food and great people. However, heading back to school today was quite rough, and I think we all agree that Christmas really needs to have more than one day off from school. This morning I wasn't looking forward to anther busy day (yeah, another 5-class day), but when I was sitting at my desk this morning, my co-teacher came over and handed me a gift. She wrote me a really nice note about how much she appreciated my gift, and inside the gift bag she handed me was a pair of really awesome mittens. Coincidentally, I've been putting off buying mittens, so it's the perfect gift. Although I would have loved to have been with my family on Christmas, overall Thanksgiving was much more difficult for me. On Thanksgiving day it took all of my strength not to cry while at school, probably because to everyone else it was just a regular Thursday--no one understood that it was an important day. Although Christmas doesn't have the same magnitude of importance in Korea as it does in America, at least it is still a recognized day with some significance. I made a comment to my friend the other day about how I couldn't believe I was missing Christmas. She responded by saying I wasn't missing Christmas, it was just a different Christmas. She was completely right. 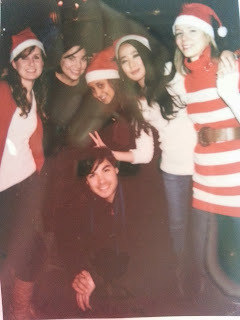 This was a different Christmas, but it was still Christmas. God willing, I will have plenty of other Christmases with my family back at home. I have no idea where I will be next year at this time, but I know for certain I won't be celebrating with all the people I did this year. The majority of us will be in different places next year, so I'm thankful for being able to spend time together, even for just this brief period. Thank you to everyone who sent me love this week. I cannot adequately express how much it means to me to have the support and love of so many wonderful people. Love you all, and I hope your Christmas was absolutely fantastic.